Barcelona overturned a two-goal first-leg deficit as they thrashed Sevilla to reach the Copa del Rey semi-finals. 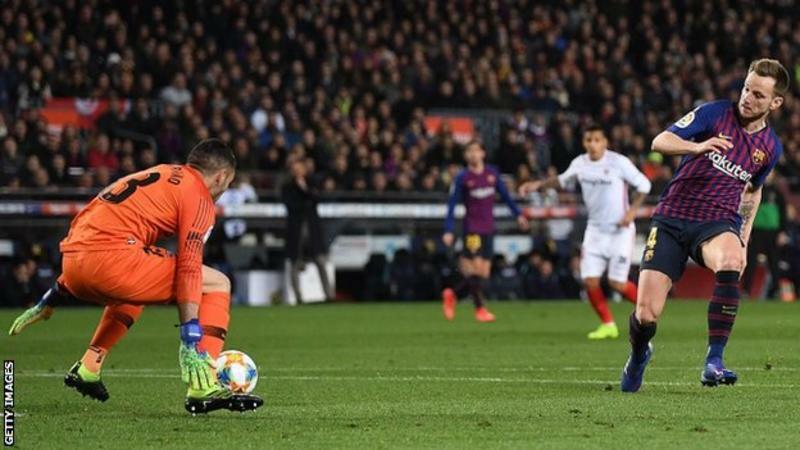 Sevilla, 2-0 winners in the first leg, went behind through Philippe Coutinho's penalty, before Ever Banega had a spot-kick saved by Barca's Jasper Cillessen. Ivan Rakitic prodded in a second, Coutinho headed in a third and Sergi Roberto gave Barca a 4-2 overall lead. Guilherme Arana pulled one back for Sevilla, but fine team goals from Luis Suarez and Lionel Messi sealed the win. It finished 6-1 in the second leg at the Nou Camp, as the holders completed a 6-3 aggregate victory to join Valencia and Real Betis in the final four. In the fourth quarter-final, Real Madrid travel to Girona on Thursday, leading 4-2 from the first leg.